Leyland cypress (Cupressocyparis leylandii) has been a very popular landscape tree in the U.S. for many decades. It has endearing characteristics, most notably its fast-growing nature and ability to make an appealing boundary around property. However, various diseases have created an overwhelming survival hurdle. Seiridium or Botryosphaeria cankers (also referred to as dieback) are fungal diseases that can strike Leyland cypress. In general terms, cankers are multiple dark oval lesions that are usually sunken into the bark. The lesions are accompanied by the flow of resin. Discolored branches will be seen first as an indicator. If the fungus finds its way into the body of the trunk, most likely the tree will not survive. With Seiridium canker, girdling of branches and stems is not an issue, however needles will fall off the branches easily. With Botryoshaeria canker, stem girdling will occur, killing the branch, but needles generally will stay on the branch. Passalora Needle Blight or commonly known as twig blight, caused by the fungus Passalora sequoia, is a major concern in the Southeast. The disease is usually more active in the spring and summer months and affects mostly younger growth. Symptoms of the disease are the browning of needles, followed by needle drop. Disease usually begins on the lower part of the tree and moves up. Sometimes the disease is widespread on one side of the tree only, where sunlight is not able to dry moisture quickly. Ventilation is key when planting these trees as a border hedge. However, the Panhandle environment and climate is very conducive for these pathogens to affect the vulnerable Leyland cypress. 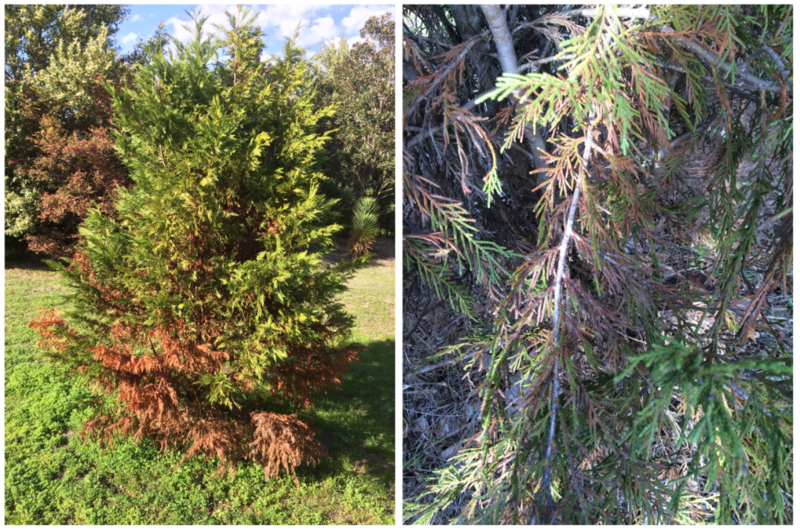 If you have or will plant Leyland cypress, there are some fungicide options to consider as preventive maintenance. It’s important to stress that trees that are already infested, will succumb to the disease regardless of treatment. Fungicides such as Daconil & Mancozeb (Pentathlon) can be used in the spring & fall. Propiconazole is the best fungicide for the warmer, summer months (June through August). Fungicides such as Myclobutanil or Thiophanate-methyl are also commonly used. Always read application directions and pay close attention to the application rate interval. There are other evergreen options, that have a much higher likelihood of not contracting a fungal disease that can cause terminal results. Native species like the red cedar (Juniperus virginiana) or white cedar (Thuja occidentalis) are great choices. Again, these species are not totally immune to twig blight or other fungal pathogens, but they are hardier and less likely to contract diseases. For more information, please contact your local county extension office.